Or this one (MySpace IM)? 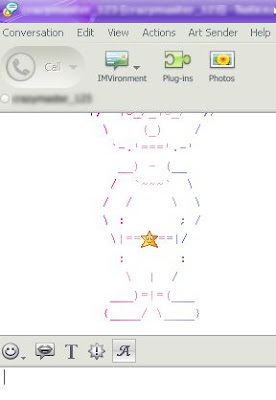 You just need a free software called as Art Sender to do that job. 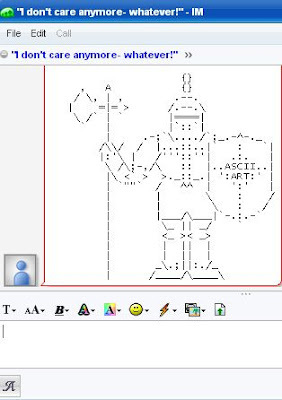 With just a single click you can make a lot of ASCII Arts (Picture of Animal, Greeting, Person, Love, Sports, Military Stuff, Cartoon, Flower and many more) to your friends. 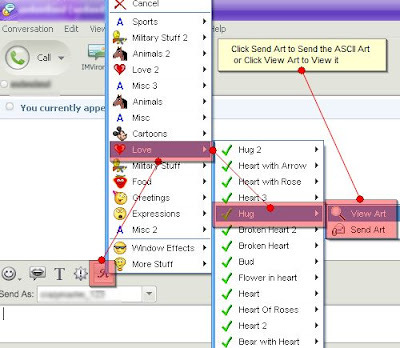 It works properly in Yahoo Messenger (Version 8, Version 9 and Version 10) and also MySpace IM. Note: If your friends use another client (unofficial clients such as Yahaven, Yazak, YahElite, or else – Multi Protocol Messenger likes Pidgin or Miranda IM, Web Base Messenger likes Meebo, or Mobile Messenger likes Nefanasa) of Yahoo Messenger, it seems that Art Sender did not work properly.